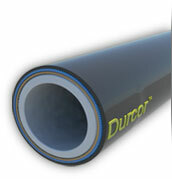 Durcor® is the world's first advanced structural composite piping system lined with seamless PTFE. Its thick wall PTFE liner provides maximum internal chemical resistance while Durcor's vinyl ester resin backbone eliminates the devastating effects of environmental corrosion externally. Durcor 50' FEP lined pipe spools are designed to save you money by making installation faster and safer, with fewer potential leak paths. Zero corrosion lets you focus on running your business, not fixing it. 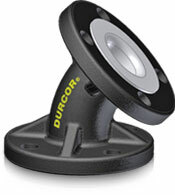 FEP lined Durcor 50' pipe spools are available in 1"-4" and will handle full vacuum & temperatures to 300°. Durcor® is the world’s first advanced structural composite piping system designed exclusively to be lined with seamless PTFE. This Design & Specification guide details pressure, weights, and everything you need to know about Durcor Piping. 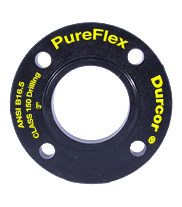 Durcor® Lap Joint Flanges are manufactured from PureFlex's proprietary advanced fiber reinforced composite. Durcor® has tensile and compressive strengths that rival steel along with outstanding impact resistance that is unmatched in the industry. Its reinforcing fibers are long and interlocked; this interlocked reinforcement system transfers loads throughout the fiber matrix, making Durcor® flanges virtually indestructible.